Grab that baby and get in shape this summer with classes at Upper Noe Recreation Center specifically designed for parents with children who don’t yet crawl (or walk). On Tuesday evenings it’s Baby and Me Yoga, where parents yearning for some Downward Dog won’t have to worry that baby’s cries will interrupt someone’s meditation. On Thursday mornings, a pack of stroller-wielding parents will walk and jog through Noe Valley with the Strollercise class. Neighborhood demand is strong for programs that target both parent and child, said Facility Coordinator Cheryl Woltjen. At the same time, the center continues to offer plenty for the preschool set. New this term will be Baby and Me for children ages 18 to 36 months on Monday, Wednesday and Friday mornings and for children ages 3-5 on Tuesday and Thursday mornings. “The teacher will use her best creative outlets for the little ones to explore their environment,” said Woltjen. Think bubbles, parachutes, circle time and games. The class, which combines facets of last term’s Tot Space and Tot Gym, requires parents, caregivers or grandparents to help the little ones dance, stretch and create. The site has also added another Karate Kidz class to meet demand among 4- to 5-year-olds. The Recreation and Parks Department will also host a free summer baseball league, sponsored by the San Francisco Giants. Upper Noe will have two Junior Giants teams for 5- to 7-year-olds and two for 8- to 10-year-olds. Practices are one day a week and games are on Saturdays. 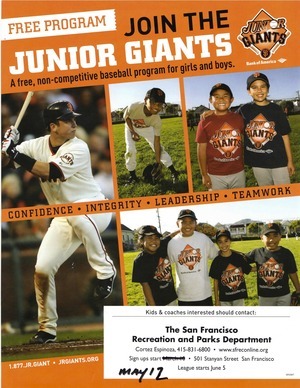 Junior Giants get to enjoy equipment provided by the San Francisco Giants, including a pitching machine and uniforms. Summer camp at Upper Noe finishes at 3 p.m., meaning some class times have changed. 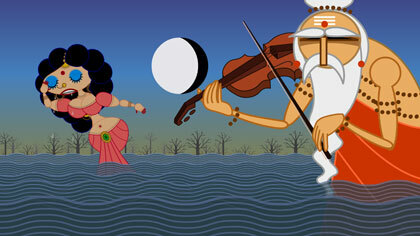 Some classes—like Senior Tango and Tween Theater—-have been suspended until fall, Woltjen said. Please see our website or www.sfreconline.com for specific times and dates. Registration begins May 12. You can register online or in person at the recreation center. To register online, you will need a free family account (find out how to get one here), or you can sign up for a family account when you enroll in classes at the recreation center itself. The Friends of Noe Valley Recreation Center and the Community Recreation Council have come together again to host Movie Night on Saturday, June 16. The evening will start with a ribbon cutting for the site’s new sandbox cover at 4 p.m. The popcorn machine will be popping by the time cartoons start at 4:30 p.m. A half hour intermission ending at 5:30 p.m. precedes the evening’s PG-rated feature, Sita Sings the Blues. This animated family movie, rated PG, was made in Noe Valley, and the neighborhood is prominently featured. The event is free. Children are encouraged to bring pillows and sleeping bags to get comfortable, and their will be folded chairs as well. Come join us for some summer fun! The Recreation and Parks Department’s interns from San Francisco State University have been organizing events at recreation centers across the city. At Upper Noe last month, the interns set up an evening of free swing and lindy hop lessons as well as a benefit for Camp Azure, the department’s day camp for children with autism. Keep an eye for upcoming events on our Community Calendar. Catch the antics of four inept sailors storming the high seas when Circus Finelli previews its latest show “Over the Waves” at Upper Noe Recreation Center Saturday, May 12, from 9 to 11 a.m.
“Most of our shows have fallen into the theme of a circus going wrong, so this one’s a little different,” said Luz Gaxiola. 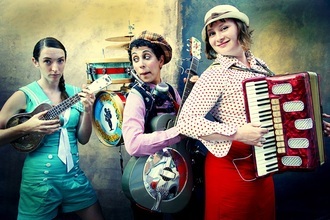 Gaxiola and troupe-mates Mahsa Matin, Verka Zaskodna and Molly Shannon always include miming, acrobatics, juggling and music on unusual instruments into their shows. They interact with the audience as well. Though the May concert will happen at the usual time, please note that starting in June, the summer Tot Concerts will happen in the afternoon from 2 to 5 p.m. to make way for a morning Zumba class. 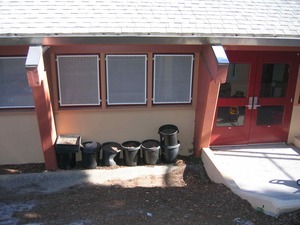 Friends of Noe Valley Recreation Center are applying for a city grant to turn the Sanchez Street side of the building into a more useful space that can accommodate classes and quiet time. The patio outside the kitchen would be extended toward Day Street and include tables and seating. The garden sloping down from the street toward the building would be terraced and sown with Californa native plants and food. The new space will serve as an outdoor classroom, linking food grown in the garden with meals cooked in the kitchen. The hope is to create a better flow between the two patios as well. Overall, the area would be flexible enough for other uses, including outdoor art for the site’s summer camps. We want to hear from you! If you have ideas or comments, please email info@noevalleyreccenter.com and let us know. Applications to the grant, known as the Community Opportunity Fund, are due in June. 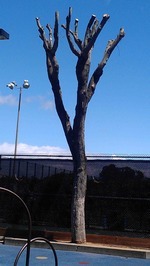 Wondering what happened to those Eucalyptus trees that hung down between the tennis court and the playground? The pruning team told Woltjen to expect green leaves to reappear in six months, she said. Looking at the bright side, the dog park now has a much better view of hillside west of the center, said Chris Faust, a Joby’s Dog Run regular. The LadyBug Gardeners will break in May and June unless someone can volunteer to supervise a second Saturday crew in the absence of lead LadyBug Joan Lionberger. “You have to work with a (city) gardener, and the gardener won’t come unless there is a supervisor,” she said, adding that she is hopeful a neighbor can step into the role. 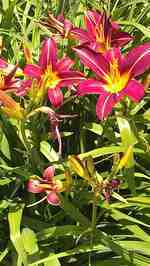 The supervisor arrives at 9 a.m. to get a list of tasks from the gardener, then assigns those to the volunteers. The work ends at noon. Lionberger added that green thumbs are welcome to drop by the center on Wednesdays to work with the gardener during his regularly scheduled shift. Signs of spring are evident on the center’s grounds, with iris, hibiscus and the new native plants along Sanchez Street in full bloom. Lionberger worries that weeds will soon have their way if there aren’t more gardening volunteers, though. “It’s just the old faithful who show up,” she said. More neighborhood help is needed, and as always, families with children are encouraged to grab a trowel and get grubby for a good cause! To volunteer in any capacity or learn more, please email info@noevalleyreccenter.com. • Serve as a greeter for the free concerts. 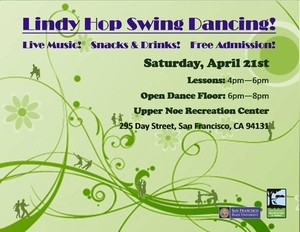 The Friends of Noe Valley Rec Center need a “friend” to help us greet families during our monthly free concert. Let them know about our mailing list and introduce them to our small group. Our greeters hand out flyers and accept donations for the concert series. The next opportunity will be May 12 from 9 a.m. to noon. Even volunteering for one hour would make a big difference! Bring your under-fives and groove to the beat of Circus Finelli! Agenda will focus on transportation issues including the J-Church proposed improvements, kids-ride-free proposal and Sunday meters for MTA revenue. This year’s tour features nine gardens located across the neighborhood. Three were created by professional designers—Janet Moyer Landscaping, Michele Schaal, and Shape of the Earth—and six were created by their owners. The Moyer-designed garden is recently installed and gives a sense of what an urban paradise looks like in its infancy.